Let’s talk about poop- seriously. It’s something we’ve never talked about before. But here’s the truth, everybody poops...and I’m pretty sure “women” fall under the category of everybody. We can try to run from the fact that it actually happens, go into another bathroom or wait until no one is around, but yeah it’s happening. And it should! Daily in-fact. This post may be a little TMI for some of you, but I feel like it’s a topic that should be talked about. And again… we are friends, right!?? Apparently there is no rule that says you have to go once a day. But it is your bodies way of eliminating waste, so it is best that you do go daily, if not twice a day. Not pooping for a day or two may happen on occasion though. In short, I guess, if you feel okay– no trouble making it etc., you probably don’t need to worry. Personally, I like to go first thing in the morning and if I don't- I feel terrible the rest of the day. I'm like clock work *if I’m home*. And that's a whole other story. Traveling takes it's toll on my tummy. Does the same thing happen to you? It does for most. I feel like since I’ve gotten older, things are changing. It’s not only my skin, my body and my mind, it is my gut as well. I guess once you hit 40, this is what happens. I’ve had to figure out a few things to help me along in this department, and my hope is that maybe it can help you too! First, before doing any of the things I am about to discuss, I certainly make sure my water intake is good. I’m telling you, that makes a world of difference! As a rule of thumb, you should drink half your body weight in ounces of water a day. So for me that is about 65 oz. of water a day, if not more. Yes, I know that sounds cra cra, but try it. You will notice such a difference in so many things. I can totally tell when I'm down on my water intake. I know that seems overwhelming, but it really will help move things along. Obviously getting enough vegetables + fiber is key. Coffee typically gets things going in the morning for me, along with the fact that I am an early riser and try to get plenty of sleep. I am in bed by 9:30 p.m. at the latest. I think this helps my body relax. I typically rise at 5 a.m., brew my coffee, check my email and have at least 45 minutes to an hour alone in the morning. If that doesn’t get things going, I feel like I am already set up for an uncomfortable day. That is one of the reasons why I think traveling hinders my ability, because typically I’m not alone and we’re up off to an activity and never have that free time to myself. Plus your eating habits are usually not what they are at home. Ya know, like treating yourself to french fries, just because. Another practice I have implemented into my routine is that I drink an herbal smooth move tea every night before bed. I found in the last few months, that has really worked well. The brand I like to use is Traditional Medicinals Smooth Move. You can usually find at the grocery store. Another product that I really love is Nature's Calm. I mix one spoonful with warm water, and drink before I go to bed. It is magnesium powder and it helps to calm, relax, and makes me sleep like a baby & poop like a champion. Lol! I swear by this stuff. way it should. Aren’t we all? Apparently it’s all in the positioning as well. 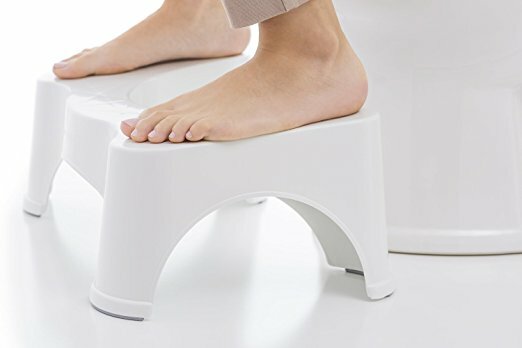 Have you ever heard of a squatty potty? I don’t own one of these, but I’ve heard they do wonders. I’m thinking of ordering one, so I’ll have to report back and let you know. Do you have one of these? People that do swear by them. Let me know, I'd love to hear your thoughts! It's in my amazon cart currently. Ever heard of it? Ever done it? I have to be honest when I first heard about it, I thought what in the world? Why would anyone ever want to have this done. Well, don’t knock it till you try it. My sweet friend, Virginia, Your Life Edit, was the one who told me about it. She may or may not appreciate this, but she asked me if I’d ever had it done and I said no. She said oh my gosh! You have to! Now, it’s not for everyone, but give it a try. I did, and let me just say, it was amazing. I couldn’t believe how good I felt afterwards. I tap danced right out of that place. No, it doesn’t hurt. It doesn’t smell. Of course it is a tad bit uncomfortable, or maybe just strange. I mean it is an exit and the idea of something going in, well is just ....... but where I went, the lady made me very comfortable and relaxed and I had no trouble. One session is like having 9 to 12 movements. WHAT! Yep. Talk about a flat stomach. WOW. From my understanding, and how she explained it, It's most beneficial to go in three different sessions. This isn’t something that I’m recommending, nor am I a doctor, but I would definitely recommend researching a reputable place before doing this. Traveling has recently started to cause trouble for me. I swear it’s like my bum knows when it’s not home. My husband thinks I’m crazy, but I swear mens plumbing it totally different. He could go in a gas station bathroom. No thanks! I’m always amazed by is ability to relax in an environment like that. I mean stop me if this sounds familiar, but you’re on vacation enjoying your days on the beach + sun + toes in the sand but there’s just one problem you haven’t gone in days?! Is sitting on the plane for a couple hours enough to dry out your colon??? The answer is YES. On an average 10 hour flight, men can lose approximately two liters of water and women around 1.6 liters. This means that on a London to Sydney flight a passenger could lose up to 4 liters and 8% of their bodily water.’- read more here. Actually, hydration is a serious thing and you can be get really dehydrated on a plane and it just makes everything worse. I don’t know about you, but I forget to drink as much water when we’re outside, on the go, etc. plus you’re probably eating differently than you would at home and of course you’re not in your own bathroom or maybe even the time zone? Either way I seem to always have trouble. Ugh. It's the worst. I hope you’re comfortable enough to talk about this and no it’s not immature, gross, weird or inappropriate. Truth is, it’s happening.